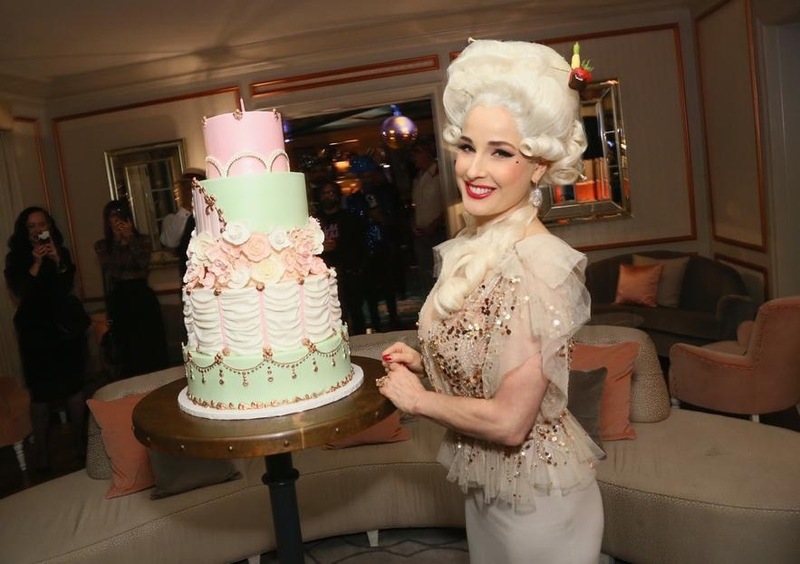 (HOLLYWOOD PRESS CORPS) — Los Angeles, CA — Saturday, September 29th, 2018 — Dita Von Teese celebrates her birthday with an intimate star studded themed birthday at the private residence of Jonas Tahlin, CEO of Absolut Elyx. Themed the “Fun’dos and Fondue” birthday party, guests wore a stunning array of wigs, hairpieces and outfits for the glamorous party. Dita arrived in a Marie Antoinette inspired outfit with a towering white wig and jeweled bodice. Adding to the glamor was the Elyx Salon, with brightly colored wigs, glitter and make up for guests to get touch ups and extra glammed! 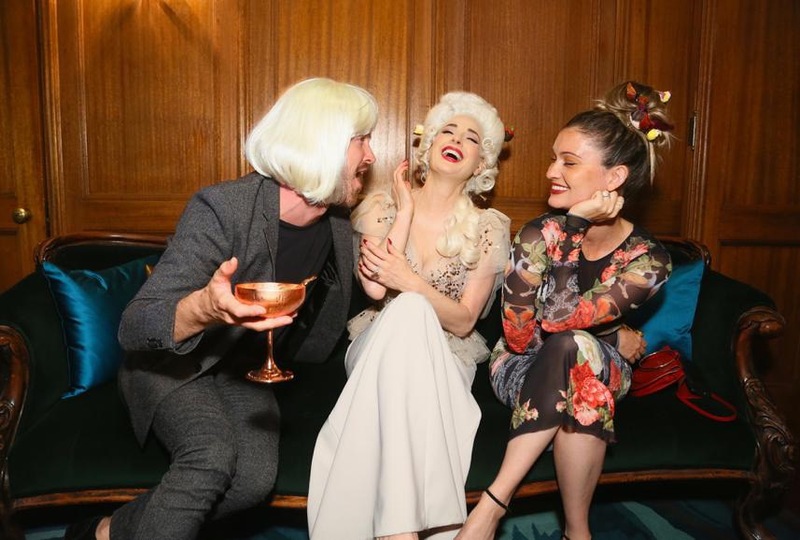 Aaron Paul enjoyed the Elyx salon and playfully wore a white cropped wig and then kept it on for the rest of the night. He was there with his wife and had fun posing for photos with his close friend the birthday girl Dita. 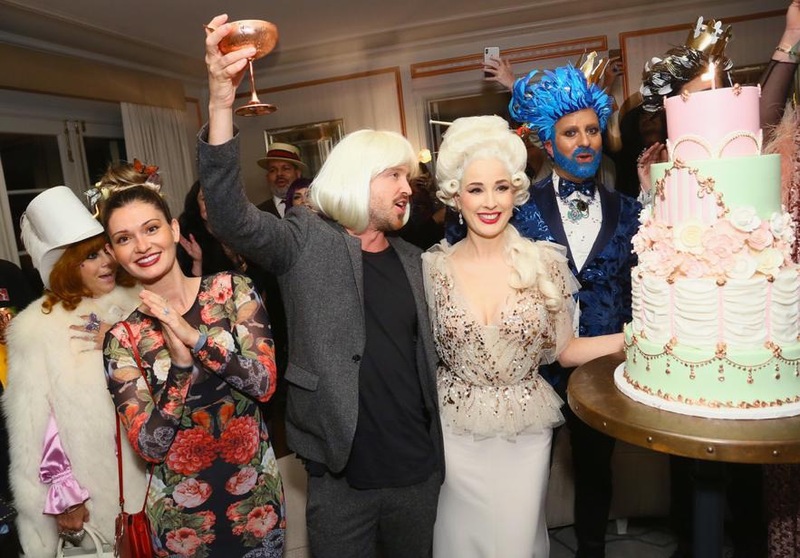 Close to midnight, a five-tiered birthday cake was delivered to the Gatsby Room of the Elyx house and guests gathered to sing happy birthday to Dita. Throughout the night, guests enjoyed specialty themed cocktails including the Filthy Dirty Martini, the Iced Jasmine Teese, the Tight Lacer and the Cherry on Top, all suitably inspired by Dita’s long running reign as the international Queen of Burlesque. Earlier this year, Absolut Elyx announced a partnership with the fashion and burlesque icon for the ‘Dita Von Teese and the Copper Coupe’ show, her new national and international tour. The new show now features many glittering new copper elements throughout the all inspired by Absolut Elyx and the unique copper distilling process for the luxury vodka. New copper infused acts include the Dita appearing in a giant-sized copper seashell on stage with 1,200 pearl balloons that float from the sky and the grand finale featured the new ‘Copper Coupe,’ part of Dita’s stunning signature cocktail glass act.